Relax on your veranda with a soothing sundowner, while enjoying the vibrant, breathtaking views all around you. Recline on an African hillock, where the surrounding orange groves overlook the dam. 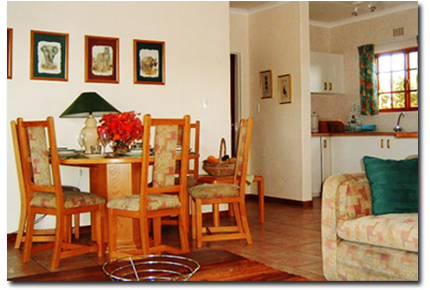 Indulge in the comfort of this air conditioned self catering cottage. Cottage has two furnished bedrooms (main-en-suite) that sleeps 4-6 people, two bathrooms, an open plan kitchen with laundry room. Full DSTV with own decoder and smart card, otherwise all SABC channels apply.